Engineered microbes are capable of rapid exponential reproduction, and subsequent industrial-scale production of chemicals, fuels, pharmaceuticals, and more. The energy and feedstock needs of such microbes can be supplied by biomass-derived sugars, which are becoming more economical every year due to scientific progress in microbial engineering. 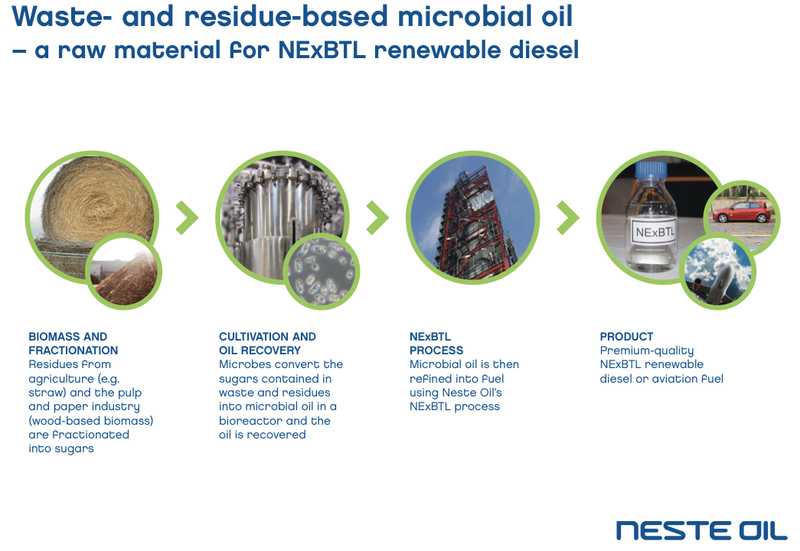 Neste Oil has completed the first phase of its project to build a pilot plant for producing microbial oil for use as a feedstock for NExBTL renewable diesel. Construction of the plant is on-schedule and on-budget. (Earlier post.) The first phase will enable the growth of oil-producing micro-organisms, and the following phases will concentrate on raw material pretreatment and oil recovery. The technology is designed to produce feedstock for NExBTL renewable diesel by using yeast and fungi to convert sugars from waste and residues into oil highly efficiently. It utilizes bioreactors similar to those used in the biotech and brewing industries. Commercial-scale production is expected by 2015 at the earliest. A wide range of different waste and residue materials can be used, such as straw and sidestreams from the pulp and paper industry, which makes feedstock optimization possible. Neste Oil has been one of the leaders in advanced biofuel and renewable diesel production. Up until now the profitability in this area has not been particularly high, but the numbers are improving with every new bioscientific breakthrough. But in mainstream energy economics, the deluge of energy from tight oil & gas has altered the timetable for many advanced biofuels projects. It is likely that many of of the scheduled projects of Neste Oil and other companies, will be delayed -- in terms of actually coming to market.